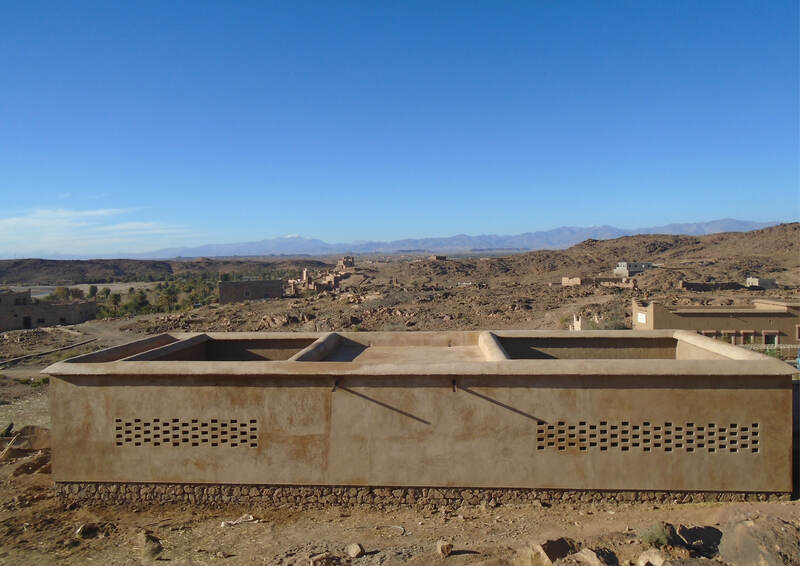 Students of the Katholieke Universiteit Leuven along with BC Architects, the French NGO Goodplanet Foundation and the Moroccan Association Norsys completed a project which entailed the extension to an existing school to provide facilities for a kindergarten (pre-school) in the town of Ouled Merzog. 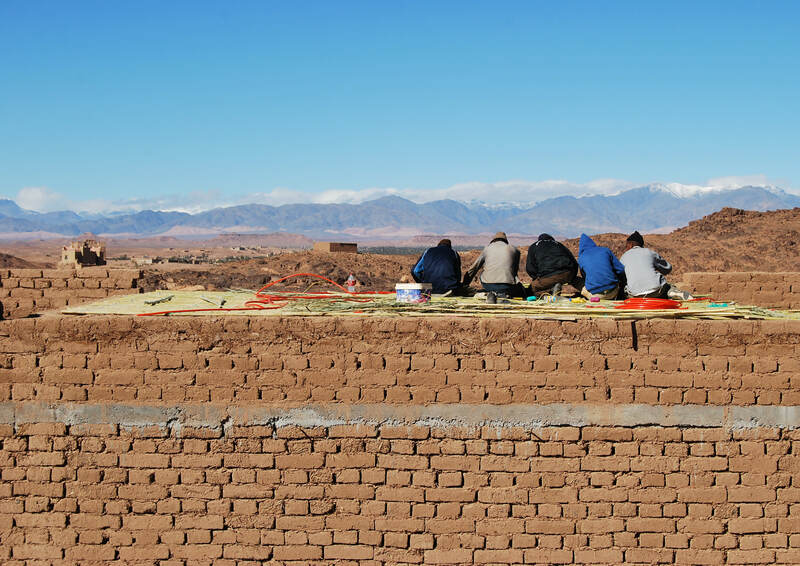 The preschool of Aknaibich has foundations of locally sourced nature stone, with adobe walls, a wood-and-earth flat roof. The exterior finishing is done with a “tamelass” render, a mix of 2 earths, straw and sand, while the interior finishing is made of polished “nouss-nouss”, a “half-half” of earth and gypsum to create a breathable interior plaster which diffuses indirect sunlight. The southeast and northwest façades which have harsh low-sun impacts are protected by tree or courtyard shadows, while the south façade has a cavity wall for insulation and a big thermal mass, making the building cool during the day, but warmer through the night until the morning. The classroom links to two courtyards, one on each side. just outside, which can be read as the playground for the smaller ones (3-6 years) as opposed to the bigger courtyard serving the rest of the school students. This playground can be used as an external classroom for storytelling and other activities. 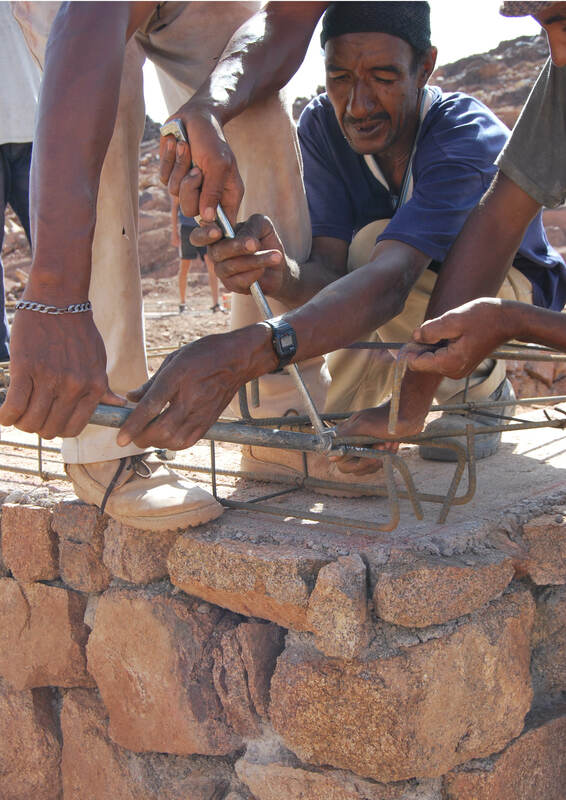 The Goodplanet Foundation (www.goodplanet.org), has developed a program of rehabilitation of bio-climatic schools. 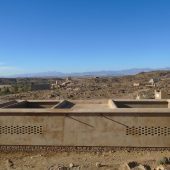 Through this program, they aim to bring the theme of climate change into the heart of moroccan rural communities, while at the same time providing for education-deprived area’s. The systematic application of available local resources and materials integrate these constructions in their environment, and interact in a smart way with local climatic circumstances. These contextual projects stand at the crossroad between innovative technologies and traditional knowledge, between “high-tech” and “low-tech”. The Goodplanet Foundation contacted BC Architects who developed the project within a design studio at the faculty of architecture of the KUL. In collaboration with students it researched the local techniques and developed a design. The students were able to obtain scholarships in order to participate in the construction process. 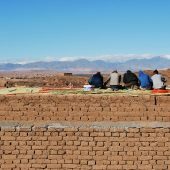 In September 2016 students and BC Architects travelled to Morocco to begin construction. The project is due to be completed by the end of January 2017. 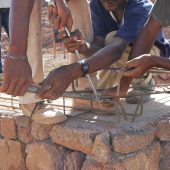 Research Question: The research aims to develop sustainable and bio-climatic construction techniques using local materials, knowledge and craftsmanship in order to construct architecturally relevant schools in rural areas.